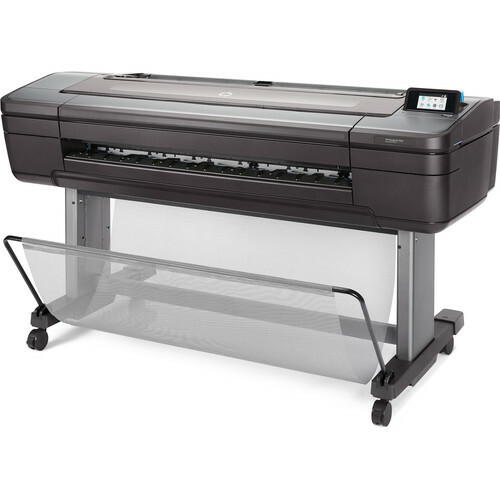 Designed for professional photographers, graphic designers, and print service providers, the DesignJet Z6 Dual Roll 44" PostScript Printer from HP quickly delivers large format, photo quality prints at a resolution of 2400 x 1200 dpi. With 2400 nozzles-per-inch, the high-definition printheads produce sharp details with high-contrast colors, and when used with HP Vivid Photo Inks you can create water and fade resistant prints for indoor and outdoor use. The printheads also utilize dual drop technology and HP Pixel Control. The dual drop technology eliminates the need for light inks and saves on consumables, while Pixel Control is an imaging pipeline that controls output pixel-by-pixel for smooth transitions. The printer accepts sheet and roll media and comes with a horizontal and vertical trimmer for cleanly and precisely cutting your media. Control of the printer is enabled via an intuitive touchscreen, and Ethernet and USB connectivity allow for direct control from a desktop or laptop computer. For wireless control from a smartphone or tablet, the printer is compatible with mobile apps for iOS, Android, and Chrome OS operating systems, and included in the software suite is HP Web Jetadmin, which allows you to manage printer access and monitor what types of jobs are being printed and how much ink is being used. Box Dimensions (LxWxH) 76.0 x 30.5 x 27.5"